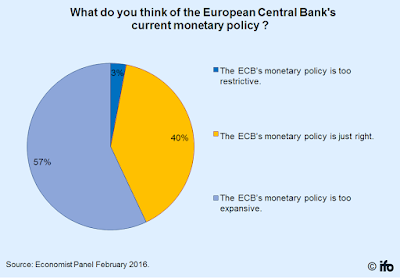 28/2/16: ECB in March: A Thaw or a Spring Blizzard? My comment on what to expect from the ECB in March for Expresso http://en.calameo.com/books/004629676f86bc6c6796a. While the transmission mechanism has been improving in recent months across the euro area, leading to stronger lending conditions across the common currency area and a wider range of the member states' economies, inflationary dynamics remained extremely weak, even when stripping out the effects of oil and other commodities prices. As the result, ECB continues to see inflation as the key target and is likely to intensify its efforts to boost price formation mechanism. Thus, despite all the ECB efforts, inflation remains stubbornly low and even slipping back toward zero in more recent data prints. Improved lending is not sufficient to create a major capex boost on the ground, weighing heavily on growth dynamics. Lower costs of borrowing for the euro area governments, while providing significant room for fiscal manoeuvre, is simply not sufficient to sustain a robust recovery. About the only functioning side of the monetary policy to-date has been the devaluation of the euro vis a vis the US dollar - a dynamic more influenced by the Fed policy stance than by the ECB alone. My expectation is that the ECB will cut its deposit rate to -40 bps (a cut of 10 basis points on current) with a strong chance that such a cut can be even deeper. We can further expect some announcement on an extension of the QE programme beyond the end of 1H 2017. The key problem, however, is that the ECB is also becoming more and more aware of the evidence that past QE measures in Japan, the UK, the euro area and across Europe ex-Euro area have failed to deliver a sufficient demand side boost to these economies. 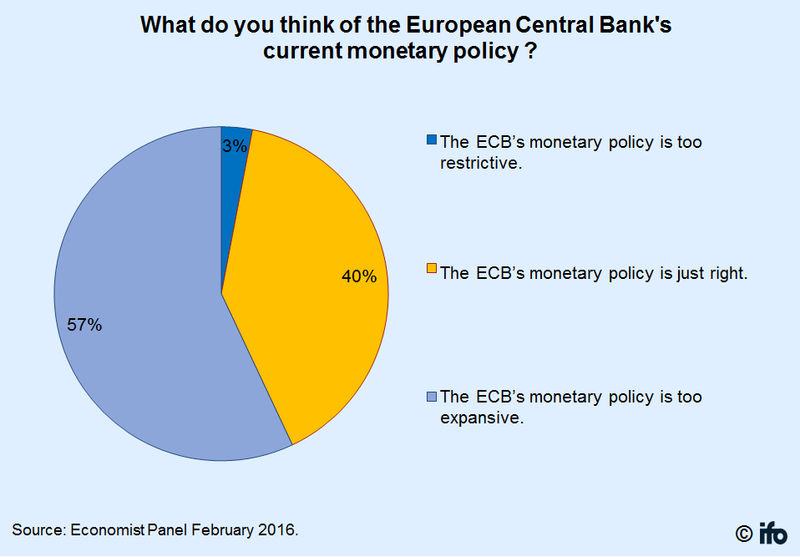 Thus, in recent months, the ECB has been increasing rhetorical pressure on member states governments to engage in supply side stimuli. Unfortunately, this too is a misguided effort. In the present conditions, characterised by markets uncertainty, heavy debt overhangs and mis-allocated investment on foot of previous QE rounds, neither supply nor demand sides of the policy equation hold a promise of repairing the euro area economy. In addition, accelerated QE will likely feed through to the markets via higher volatility and possible liquidity tightening (bid-ask spreads widening, fear of scarcity of high quality government bonds and uncertainty over viability of the current monetary policy course). Turkish channel Kanal Finans covers my post on Deutsche Bank trials & tribulations: http://kanalfinans.com/one-cikanlar/bir-deutsche-bank-krizi-vardi-ne-oldu-sant-manukyan. Portugal's Expresso reviewing Paul Mason's ( @paulmasonnews ) recent book "Postcapitalism: A Guide to Our Future" here: http://expresso.sapo.pt/economia/2016-02-28-Vem-ai-o-pos-capitalismo, including a comment of mine. 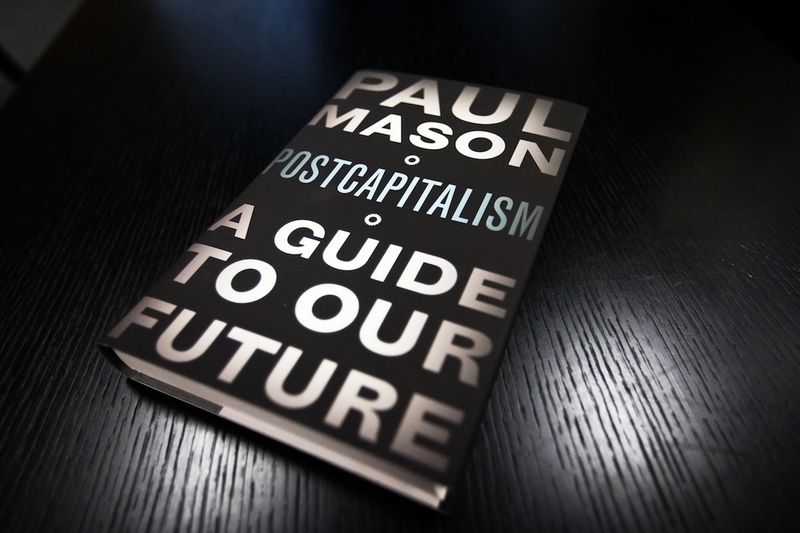 In his latest book, Paul Mason tackles some key themes of the global economic development in the new millennium : themes of debt overhangs, technological disruptions and the shifting of political, social and economic systems toward more data-intensive, more open and democratic platforms. Noting the links between the fragility of the global financial system (the financialisation hypothesis), persistent macroeconomic imbalances (global current account imbalances and savings-investment mismatch), and the severe levels of private and public indebtedness, he draws two key conclusions that are required to describe the current state of the world economy: the link between the no-longer sustainable model of economic growth based on leveraging, and the need to break the status quo of indebtedness in the real economy. For those of us, who have, over the years, persistently called for these changes to be enabled by fiscal and monetary policies, Mason's book is a welcome addition to the arsenal of intellectual arguments supporting real change in the ways we structure our macroeconomic policies. For those who, like majority of Europe's political elites, have sleepwalked through the ongoing financial, fiscal, monetary and economic crises, it is a necessary wake up call. I covered the above themes throughout the blog and across a range of articles in the past, most recent being this example: http://trueeconomics.blogspot.com/2016/02/17216-four-horsemen-of-economic.html. I have written quite a bit about the wobbles of time-space continuum in the U.S. economic growth universe in recent months. 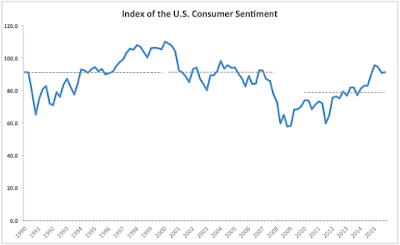 But throughout the entire process, the bedrock of U.S. growth - consumer sentiment - appeared to be relatively stable as if immune to the volatility in the fortunes of the broader economy. The above shows several things, some historical, others more current. Firstly, the impact of the crisis of 2008 and subsequent second dip in the economic crisis fortunes in 2011. These were sizeable and comparable in terms of the magnitude to the abysmal late 1970s-early 1980s period. Secondly, a steady decline in inflationary pressures on households since the early 2012. A trend bending solidly the Fed narrative of well-anchored inflationary expectations post-QE. A trend that accelerated since mid-2014 to flatten out (without a solid confirmation) toward the end of 2015. Thirdly, a longer view of the things: despite low by historical standards inflation, the share of U.S. households still concerned with its impact on their well being is... err... high and sits well above the average for 1993-2004 golden years of the first 'Great Moderation'. All of which, in my view, continues to highlight the utter and complete failure of traditional fiscal-monetary policies mix deployed since 2008 by the U.S. Fed and richly copied by the likes of the ECB. It also reflects a simple fact that inflation (even at near-zero bound) remains a concern for households who experience decades of weak income growth. Per Moody's: "We expect Russian banks' capital ratios and loan performance to bear the brunt of the country's falling currency and economic contraction. We also envisage a detrimental impact on bank profitability as rising problem loans will likely lead to higher loan-loss provisioning expenses for banks." The rouble dropped a further 3% in January 2016, after falling 23% versus the dollar in the second half of 2015. At the same time, the Russian economy contracted by 4% real GDP for 2015 and Moody's forecasts further GDP contraction of at least 2% in 2016. By Moody's estimate, "close to a third of the banking sector's loan book is denominated in foreign currency and the falling rouble will likely inflate the value of these loans in the calculation of risk-weighted assets (the denominator of the capital ratio) pushing it higher and, consequently, capital ratios lower. Without accounting for additional loan growth, a 10% rouble devaluation could lead to a 30 basis point negative impact on capital ratios..."
This is not as dramatic as the headline risks occupying Moody's, but material. Worse, this risk is coincident with the broader recessionary pressures on Russian banks. Thus, "Moody's expects the recession, with the added burden of currency depreciation, to lead to rising problem loans for Russia's banks. The rating agency estimates the stock of nonperforming and impaired loans in the banking system to rise to 14%-16% over the next 12 months, from an estimated 11% as of year-end 2015." The third coincident factor is the Central Bank policy space: "Currency depreciation may also prevent the Central Bank of Russia from lowering its key interest rates (currently at 11%), which sets the benchmark and influences the rates which banks pay for customer deposits and the rates at which they borrow on the interbank market." Final pressure point for the banks is deposits composition "...if corporate and retail depositors decide to protect themselves from the falling currency and switch to FX deposits. Trends so far show rouble deposits stagnating while FX deposits have increased. The percentage of FX deposits to total deposits rose to 39% as at end of December 2015, compared to 29% as at end of March 2014." March-December comparative is significant, as it sheds some light on longer term trends beyond December 2014 - March 2015 period when forex deposits of major corporates were driven down on the foot of Moscow urging de-dollarization of the deposits base, reducing cash reserves held in forex to January 2015 levels. 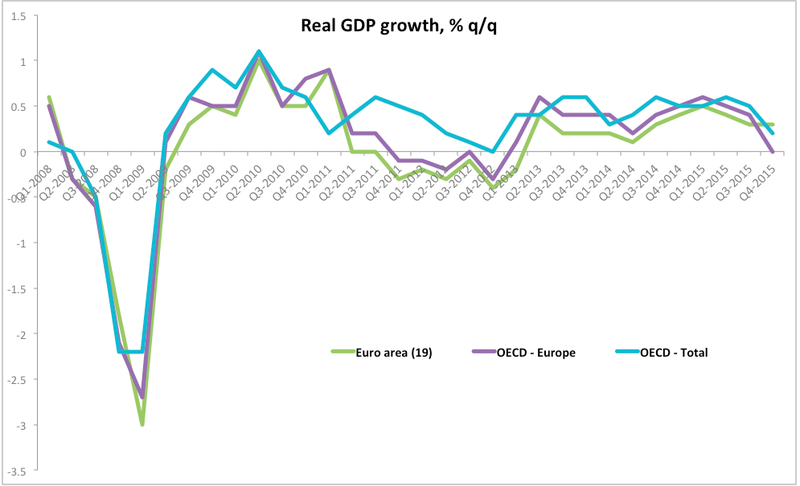 Just because everything has been so thoroughly repaired when it comes to the Advanced Economies, growth of real GDP in the OECD area has been falling for three consecutive quarters through 4Q 2015. Of course, you wouldn't know as much if you listen to exhortations of Europe's leaders, but... per OECD latest statistical update, in 2Q 2015, q/q real GDP growth across the advanced economies was 0.6%, falling to 0.5% in 3Q 2015 and to 0.2% in 4Q 2015. Which puts 4Q 2015 growth of 0.2% at lowest level since 1Q 2013. In the U.S., economic growth slowed to 0.2% in the fourth quarter, against 0.5% in the third quarter, marking second consecutive quarter of growth slowdown. 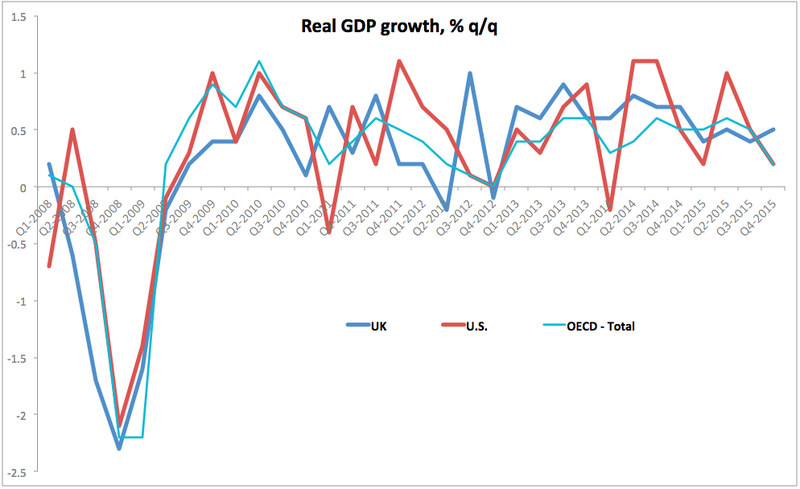 Small uptick in UK growth to 0.5% in 4Q 2015 still puts end of 2015 growth rate at below 1Q 2010-present average and at joint second lowest reading since 1Q 2013. 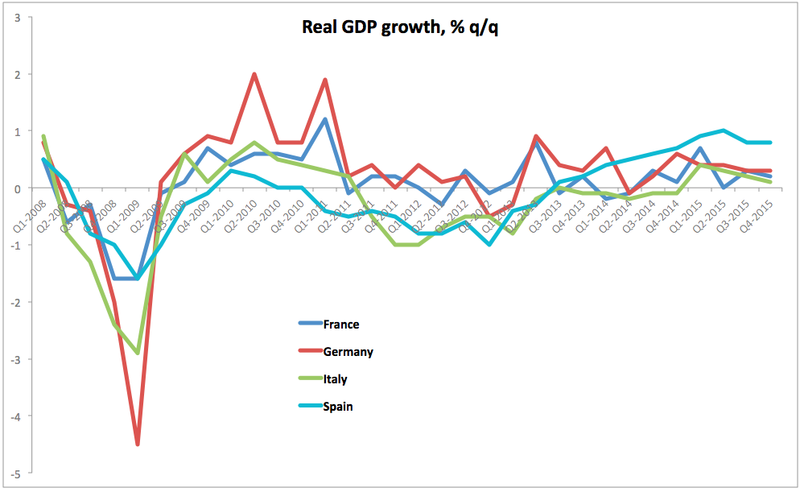 And there has been no acceleration in growth in the euro area's Big 4 for two consecutive quarters now, with both Italy and France dancing dangerously closely to hitting negative growth and Germany posting lacklustre growth since 1Q 2015. Per OECD release, "Year-on-year GDP growth for the OECD area slowed to 1.8% in the fourth quarter of 2015, down from 2.1% in the previous quarter. 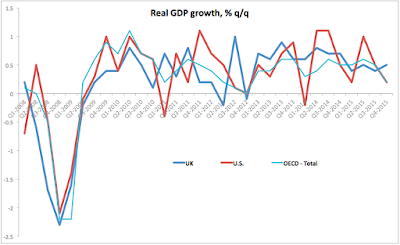 Among the Major Seven economies, the United Kingdom (1.9%) and the United States (1.8%) continued to record the highest annual growth rates, although both down from a rate of 2.1% in the previous quarter. Japan recorded the lowest annual growth rate, 0.7% compared with 1.6% in the previous quarter." "A relative majority (40 percent) of participants expects the asylum-seekers to have a negative impact on the country. Only 23 percent see them as benefitting the country. The remainder was undecided. The majority of German economics professors therefore do not share the optimism of the Deutsche Bank’s Chief Economist, David Folkerts-Landau. He described the flood of refugees as Germany’s biggest economic opportunity since its reunification. The majority of economics professors (56 percent) believes that the minimum wage should be lowered to facilitate the integration of asylum-seekers with poor skills into the German labour market. 37 percent, however, does not support this view. 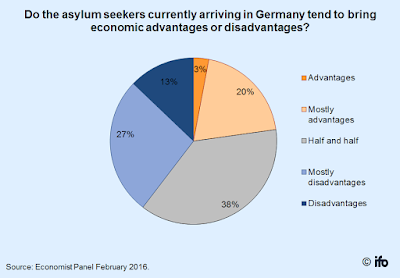 Some economists feel that this could lead to tensions between Germans and new arrivals. “I am no advocate of the minimum wage,” writes Prof. Dr. Erwin Amann of the University of Duisburg-Essen in the survey. “But a reduction in the minimum wage would prompt a debate over German workers being crowded out,” he warns." CES-Ifo just released their survey results for the regular poll of some 220 German economists. And if you think that professionals are at any odds with Schäuble on monetary policy of the ECB, think again. Still, the key point remains: Euro is still a malfunctioning currency that cannot reconcile differences between various economies. In other words, Europe's problem is not Germany. It is not France, nor Spain, nor Italy. Europe's problem is not even Euro. Instead, Europe's problem is Europe. This is an unedited version of my column for Village Magazine, December 2015. Two recent events highlight the true nature of the ongoing Irish economic recovery. Firstly, ahead of the infamous Ireland-Argentina Rugby World Cup match, the press office of the main Irish governing party, Fine Gael, produced a rather brash inforgraphic. 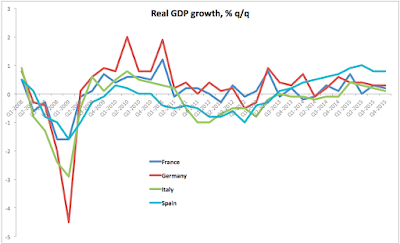 Charting projected growth rates in real GDP for 2015 across all Rugby World Cup countries, the graph put Ireland at the top of the league with 6.2 percent forecast growth. “FACT: If the Rugby World Cup was based on economic growth, Ireland would win hands down,” shouted the headline. Having put forward a valiant performance, Irish team went on to lose the game to Argentina, ending its tour of the competition. Secondly, within weeks of publication, Budget 2016 – billed by the Government as a programme for the ‘New Ireland’ – has been discounted by a range of analysts, including those with close proximity to the State as representing the return of the fiscal policy of electioneering. Worse, judging by the public opinion polls, event the average punter out there has been left with a pesky aftertaste from the political wedding cake produced by the Merrion Street on October 13th. Tasteful or not, the public gloating about headline growth figures and the fiscal chest-thumping that accompanied the Budget 2016 did not stretch far from reality. Official growth is roaring, public finance are in rude health, and the Government is back in business of handing out candies to kids on every street corner. The air is so filled with the sunshine of recovery, the talk about the Celtic Tiger Redux is back on the chatter menu for South Dublin partygoers. Irish Government is now projecting full year 2015 inflation-adjusted growth to come in at 6.2 percent followed by 4.3 percent in 2016. Less optimistic, the IMF puts 2015-2016 growth forecasts for the country at 4.9 percent and 3.8 percent, respectively. Still, this ranks Ireland at the top of the advanced economies growth league, with second place Iceland set to grow by 4.8 percent and 3.7 percent over 2015 and 2016, respectively. The only other advanced economy expected to post above 4 percent growth in 2015 is Luxembourg. Which is a telling bit: of all euro area member states, the two most exposed to tax optimization schemes are growing the fastest. Though only one has a Government gushing publicly about that fact. No medals for guessing which one. The problem is: the headline official GDP growth for Ireland means preciously little as far as the real economy is concerned. The reason for this is the composition of that growth by source and, specifically, the role of the Multinational Corporations trading from Ireland. We all know this, but keep harping about the said ‘metric’ as if it mattered. Based on the figures for the first half of 2015 (the latest available through the official national accounts), Irish economy grew by EUR6.4 billion or 6.9 percent in terms of real GDP compared to the first half of 2014. Gross National Product, or GDP accounting for the officially declared net profits of multinational companies, expanded by a more modest 6.6 percent over the same period. Other distortions arising from this structural anomaly at the heart of Irish economic miracle are the effects of foreign investment funds and companies on capital side of the National Accounts. Back in 2014, the European Union reclassified R&D spending as investment, superficially inflating both GDP and GNP growth figures. Since then, our investment has been booming, outpacing both jobs creation and domestic public and private sectors’ demand. In more recent quarters, capital investment has been outperforming exports growth too. Which begs a question: what are these investments about if not a tail sign of corporate inversions past and the forewarning of the changes in the economic output composition in anticipation of our fabled ‘Knowledge Development Box’? Beyond this, the legacy of the financial crisis adds to artificial growth statistics. Irish ‘bad bank’, Nama, and its vulture funds’ clients are aggressively disposing of real estate loans and other assets bought at a cost to the taxpayers. Any profits booked by these entities are counted as new investment here. Once again, GDP and GNP go up even if there is virtually nothing happening to buildings and sites being flipped by these investors. And while we are on the subject of the old ways, last month Ireland became a domicile of choice for an upcoming merger between Pfizer and Allergan – two giants of the global pharma world. Despite numerous claims that Ireland no longer tolerates so-called ‘tax-driven corporate inversions’ (a practice whereby U.S. multinationals domicile themselves in Ireland for tax purposes), it appears that we are back in the same game. Just as we are apparently back into the game of revenue shifting (another corporate tax practice that sets Ireland as a centre for booking global sales revenues despite no underlying activity taking place here), as exemplified by the Spanish Grifols announcement earlier in October. All of these growth sources also benefit from weaker euro relative to the dollar and sterling, courtesy of the ECB printing presses. Looking at the national accounts for January-June 2015, Gross Fixed Capital Formation accounted for EUR3.8 billion or almost 60 percent of total GDP growth over the last 12 months, or nearly 3/4 of all growth in GNP. In simple terms, the real economy in Ireland has been growing at closer to 3.5 or 4 percent annual rate in 2015 – still significant, but less impressive than the 6 percent-plus figures suggest. Still, the above growth has been kind for the Irish Government. In the nine months though September 2015, Irish Exchequer total tax receipts rose strong EUR2.75 billion, or 9.5 percent year-on-year. 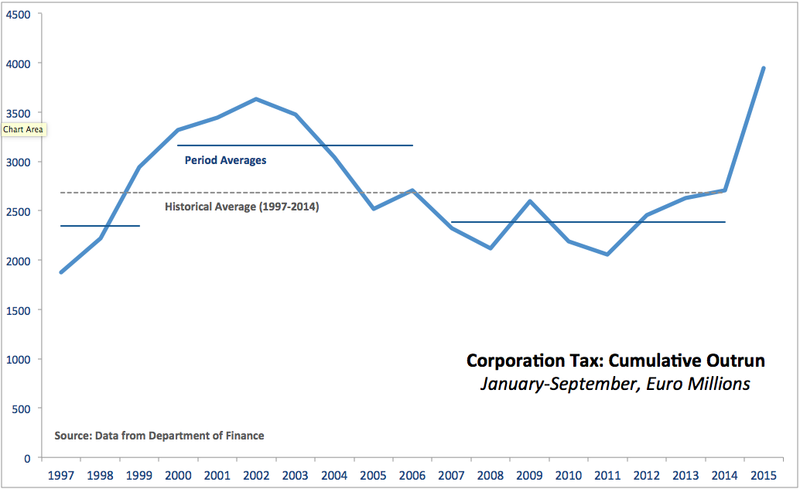 Just over 45 percent of this increase was due to unexpectedly high corporate tax receipts that rose 45.7 percent year-on-year. Vat receipts increased EUR742 million or 8.3 percent year-on-year, while income tax posted a more modest rise of EUR677 million up 5.7 percent. While both VAT and Income Tax receipts came in within 1-2 percentage points of the Budgetary targets, Corporation Tax receipts over-shot the target by a massive EUR1.21 billion or 44.2 percent. As chart below shows, in the first nine months of 2015, Corporation Tax receipts have not only outperformed the previous period trend for 2007-2014 and the historical average for 2000-2014, but posted a massive jump on the entire post-crisis ‘recovery’ period. Both the levels of tax receipts and the rate of annual growth appear to be out of line with the underlying economic performance, even when measured by official GDP growth. This prompted the by-now-famous letter from the outgoing Governor of the Central Bank, Professor Patrick Honohan to the Minister for Finance in which Professor Honohan politely, almost academically, warned the Government that a large share of the current growth in the economy is accounted for by the “distorting features” – a euphemism for tax optimising accounting. Per letter, “Neglecting these measurement issues has led some commentators to think that the economy is back to pre-crisis performance”. Professor Honohan’s warning reflects the breakdown in sources of growth noted earlier, with booming multinationals’ activity outpacing domestic economic expansion. The same is confirmed by the recent data from labour markets. For example, whilst official unemployment in Ireland has been declining over the recent years, labour force participation rates have remained well below pre-crisis averages and are currently stuck at the crisis period lows. In simple terms, until very recently, jobs creation in Ireland has been heavily concentrated in a handful of sectors and professional categories. Of course, this column has been saying the same for months now, but for Irish official media, the voice of titled authority is always worth waiting for. The Revenue attempted to explain the Exchequer trends through October, but the effort was half-hearted. Per Revenue, the UER800 million breakdown of Corporation Tax receipts outperformance relative to target can be broken into EUR350 million of the “unexpected” payments; EUR200 million to “early” payments; and EUR200 million to ‘delayed’ repayments. 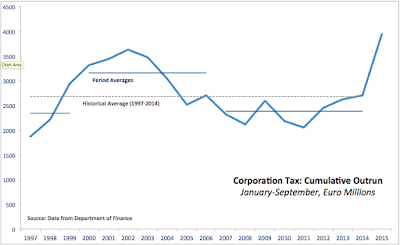 Which prompted a conclusion that the surge in tax receipts was “sustainable”. Turning back to fiscal management side of accounts, Irish debt servicing costs at end of 3Q 2015 fell EUR296 million or 5.9 percent compared to January-September 2014. The key driver of this improvement was refinancing of the IMF loans via market borrowings and, of course, the ECB-driven decline in bond yields. Neither are linked to anything the Government did. Spurred by improving revenue side, however, the Government did open up its purse. Spending on current goods and services (excluding capital investment and interest on debt) has managed to account for just under one tenth of the overall official economic growth in the first half of 2015. In other words, even before the Budget 2016 was penned and the print of improved revenues was visible on the horizon, Irish austerity has turned into business-as-usual. As the result of the tangible – albeit more modest than official GDP figures suggest – economic recovery, Budget 2016 unveiled this month marked a large scale U-turn on years of spending cuts and tax hikes. Even though the Government deficit is still running at 2.1 percent of GDP and is forecast to be 1.2 percent of GDP in 2016, the Government has approved a package of tax cuts and current spending increases worth at least EUR3 billion next year. The old formula of ‘If I have it I spend it’ is now replaced by the formula of ‘If I can borrow it I spend it’. Which means that in 2016, Ireland will run pro-cyclical fiscal policy for the second year in a row, breaking a short period of more sustainable approach to fiscal management. Another point of concern is the fact that this time around, just as in 2004-2007, expansionary budgeting is coming on foot of what appears to be one-off or short-term boost to Exchequer revenues. Finally, looking at the composition of Irish Government spending plans, both capital and current spending sides of the Budget and the multi-annual public investment framework include steep increases in spending allocations of questionable quality, including projects that potentially constitute political white elephants and electioneering. In short, the Celtic Tiger is coming back. Both – the better side of it and the worst. 18/2/16: Is the U.S. About to Slip into a Recession? Let’s start with corporate profits. 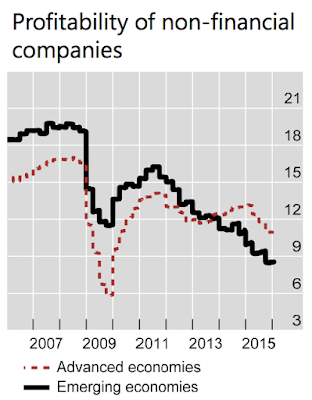 The latest data from the U.S. Federal Reserve shows that year-on-year 3Q 2015 growth in corporate profits for non-financial corporations was sharply negative - at -4.26 percent. 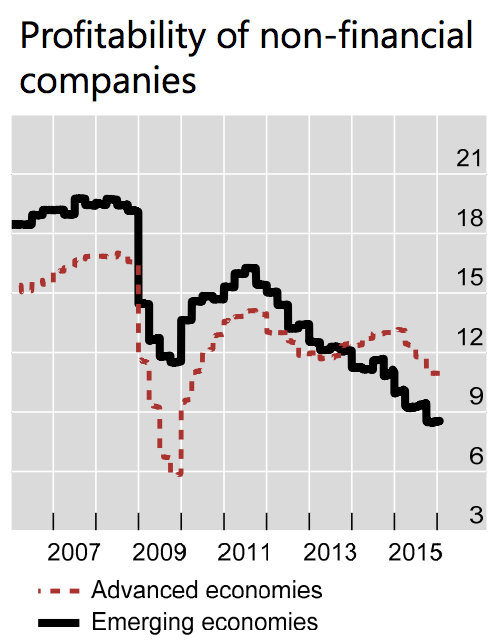 Furthermore, corporate profits growth slowed down from 7.72 percent in 1Q 2015 to 1.83 percent in 2Q 2015. 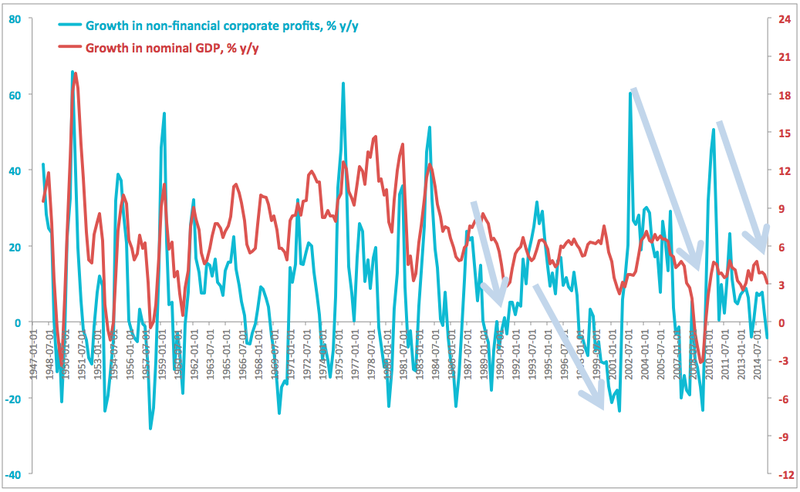 The rate of decline in corporate profits growth in the U.S. is now sharper than during the last GDP wobble in 1Q 2014 and sharper than in 3Q 2008. The latest growth figure also marks the fastest rate of decline in profits since 3Q 2009. As noted in a recent research note by J.P. Morgan Cazenove in general, credit spreads lead equities and the former “are not giving a positive signal” to the latter (see: http://trueeconomics.blogspot.com/2016/01/24116-high-yield-bonds-flash-red-for.html). So that puts two recession-beaconing stars into a perfect alignment. 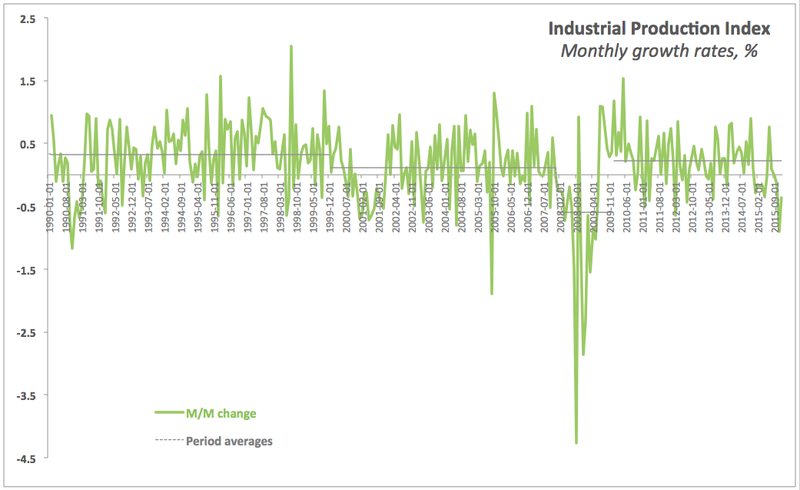 What about the U.S. Industrial Production? From over 2015, U.S. industrial output posted declines, based on monthly growth rates, in ten months out of twelve, with December 2015 production levels down almost 2 percent on December 2014 peak. In annual growth terms, output growth rate started at a brisk 4.48 percent pace in January 2015 and ended the year with a contraction of 1.75 percent - the sharpest rate of decline since December 2009. That’s a swing of some 6.23 percentage points in 12 months. Falling equity and bond prices, as well as rising retail interest rates are capable of triggering - if sustained over time - drops in consumer confidence, followed by households’ pulling back from consumption and investment. 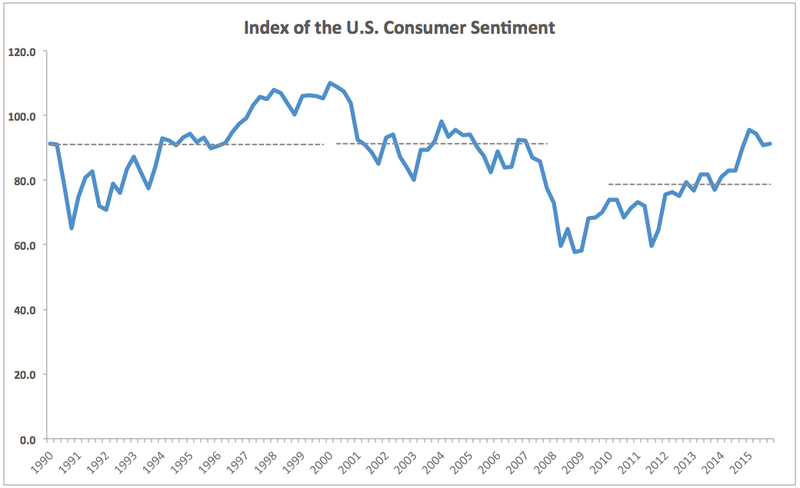 So far, stronger dollar (improving U.S. consumers’ purchasing power), lower energy prices (improving their disposable incomes) and falling unemployment (improving household pre-tax incomes) have sustained consumer confidence at healthy levels. This risk, along side growing uncertainty about overall health of the U.S. economy, are material factors for Irish and European markets and investors. Ireland benefited significantly from the U.S. recovery and subsequent devaluation of the Euro vis-à-vis the U.S. dollar. These factors underpinned our exports of goods to the U.S. and Canada rising by EUR6.85 billion for the first eleven months of 2015 compared to the same period in 2012. This growth is more than double the rate of expansion in our trade in goods with the EU (including the UK). From Irish investors perspective, our domestic assets performance – across both equities and bonds – owes a lot to the resilience of the U.S. economy. Likewise, our investors’ access to diversified portfolios of internationally-listed and traded assets cannot be imagined absent the U.S. equity and debt markets. Recent media and analysts coverage of the global economy, especially that of the advanced economies has focused on the rising degree of uncertainty surrounding growth prospects for 2016 and 2017. Much of the analysis is shlock, tending to repeat like a metronome the cliches of risk of ’monetary policy errors’ (aka: central banks, read the Fed, raising rates to fast and too high), or ‘emerging markets rot’ (aka: slowing growth in China), or ‘energy sector drag’ (aka: too little new investment into oil). However, the real four horsemen of the economic apocalypse are simply too big of the themes for the media to grasp. And, unlike ‘would be’ uncertainties that are yet to materialise, these four horsemen have arrived and are loudly banging on the castle of advanced economies gates. In this world, sub-zero interest rates don’t work, fiscal policies don’t work and neither supply, nor demand-side economics hold any serious answers. Evidence? Central bankers are now fully impotent to drive growth, despite having swallowed all monetary viagra they can handle. Meanwhile, Government are staring at debt piles so big and bond markets so touchy, any serious upward revision in yields can spell disaster for some of the largest economies in the world. More evidence? 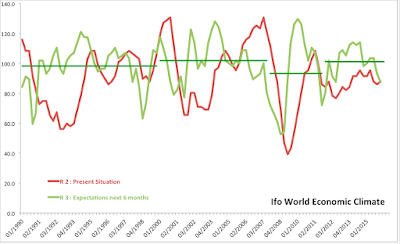 See this: http://trueeconomics.blogspot.com/2015/10/101015-imf-honey-weve-japanified-world.html. To give you a flavour: consider the ‘stronger’ economic fortress of the U.S. where the Congressional Budget Office latest forecast is that the budget deficit will rise from 2.5 percent of GDP in 2015 to 3.7 percent by 2020. None of this deficit expansion will result in any substantive stimulus to the economy or to the U.S. capital stocks. Why? Because most of the projected budget deficit increases will be consumed by increased costs of servicing the U.S. federal debt. 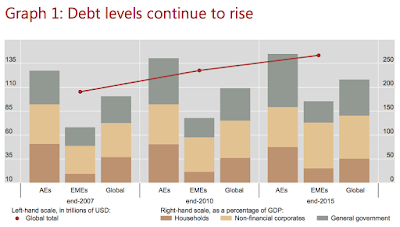 Debt servicing costs are expected to rise from 1.3 percent of GDP in 2015 to 2.3 percent in 2020. Key drivers to the upside: increasing debt levels (debt overhang), interest rate hikes (monetary policy), and lower remittances from the Federal Reserve to the U.S. Treasury (lower re-circulation of ‘profits and fees’). Actual discretionary spending that is approved through the U.S. Congress votes, excluding spending on the entitlement programs (Medicaid, Medicare and Social Security) will go down, from 6.5 percent of GDP in 2015 to 5.7 percent of GDP by 2020. 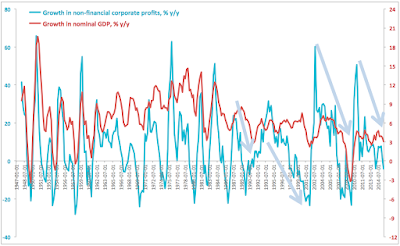 Worse, what the above chart does not show is what the effect on corporate profitability will interest rates reversions have (remember: there are two risks sitting here - risk 1 relating to central banks raising rates, risk 2 relating to banks - currently under severe pressure - raising retail margins). The above are part-legacy of the Global Financial Crisis. Boris specifies: Financial Crises tend to last much longer than business cycles, and “cause major and long-lasting damage to the real economy”. 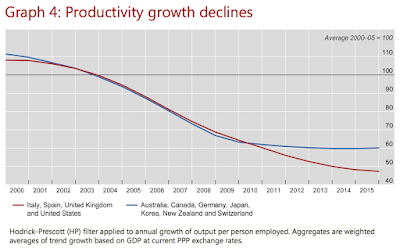 Loss in output sustained in Financial Crises are not transitory, but permanent and include “long-lasting damage to productivity growth”. Now, remember the idiot squad of politicians who kept droning on about ‘negative equity’ not mattering as long as people don’t move… well, as I kept saying: it does. Asset busts are hugely painful to repair. Boris: “Historically there is only a weak link between deflation and output growth” despite everyone running like headless chickens with ‘deflation’s upon us’ meme. But, there is a “much stronger link with asset price declines (equity and esp property)”, despite the aforementioned exhortations to the contrary amongst many politicos. And worse: there are “damaging interplay of debt with property price declines”. Which is to say that debt by itself is bad enough. Debt written against dodo property values is much worse. Hello, negative equity zombies. Because, as that hedgie said above, the corpse can’t take much of monetary zapping anymore. 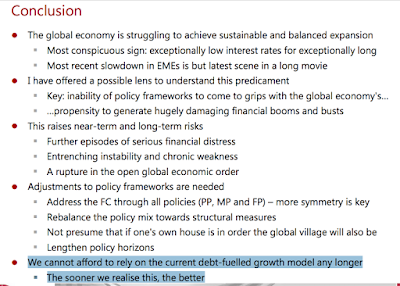 Alas, we have nothing to rely upon to replace that debt fuelled growth model either. Back in 2008, when the Irish markets were tanking, one of the managing partners in a large Irish stock brokerage issued an infamous research note, telling clients that while things were bad, things will be good again. The main point of the note was that "markets do come back" no matter what. As evidence of such "comebacks", the author of the note offered an anecdote of his relative trying to sell property prior to the onset of the Asian Financial Crisis at the end of the 1999. The sale, having fallen through due to the crisis hitting hard, was completed at 2/3rds of the original offered price some 8 years ago. 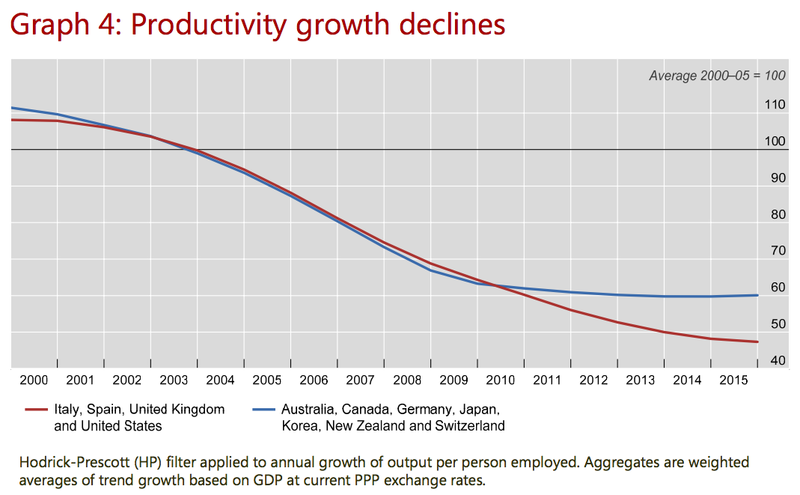 This was the analyst's evidence for the 'inevitability of recovery'. Back at the time the note was issued, I pointed out to the said analyst that he missed a major problem: inflation. By the time his relative did conclude the sale, the price he/she got for the property was down 80% or more, not 33%, because 8 years of inflation chewed through his/her returns. Ever since then, I have been tracking (occasionally - usually once a year) Irish stock exchange broadest index, ISEQ, for the signs that "markets do come back". Here is the latest update: we are still waiting for when they "come back". 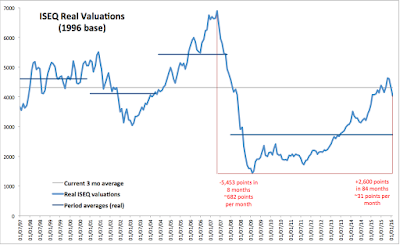 Even though ISEQ no longer contains the hardest hit, by the crisis, equities - a little cheat trick used by Irish Stuffbrokers to sell ISEQ 'returns' is never correcting them for survivourship bias, but let us indulge them on this - ISEQ is still massively below pre-crisis peak. It has not 'come back', but instead, on its peak-to-trough way, in nominal terms, it was falling 972.6 points per month on average and on its 'coming back' way from the trough it has been averaging gains of just 46.2 points per month. Which means the market drop rate was 20 times faster than the market's 'coming back' rate. The freak show of Irish stocks is self-evidently not in a rude health. The 'coming back' of the Irish markets is so bad, that if you invested in them during October 1997-December 1999 period, today you would have lost, on average 10% of your investment, and if you invested in ISEQ back in 1Q 1998, you would be down 15.8% once inflation is factored in. Worse, compared to pre-crisis peak, we are nowhere near that 'come back' territory, some 8 years and 9 months after reaching the peak, the index is still 41.4% down in real terms. Current level (using last 3 months average) of the index is below all period averages for the index, save for the period of post-dot.com crash, but using latest ISEQ reading (instead of a 3mo average), the market now is below even that abysmal period average. 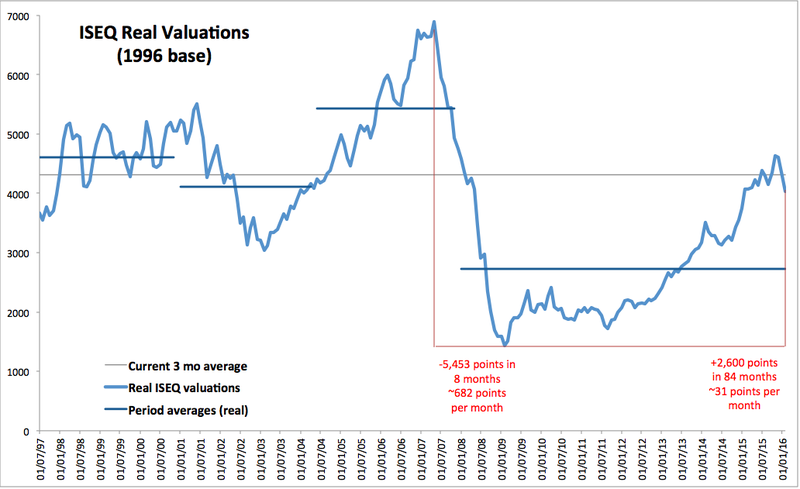 Thus, overall, at current position, ISEQ offers us not the lesson of a market that "comes back", but a market that goes nowhere over the last 18 years. And that, folks, is the combined power of inflation and nonsense that is Irish Stuffbrokerage research... err... marketing. In a recent assessment of the economic outlook for Ireland for 2016, the DG for Economic and Financial Affairs of EU has heaped praise on the country (see full list of country-specific assessments here: http://ec.europa.eu/economy_finance/eu/forecasts/2016_winter_forecast_en.htm?utm_source=e-news&utm_medium=email&utm_campaign=e-news132). Much of it - justified. However, a glaring miss in the analysis was a truthful representation of the balance of sources for growth in the economy. All of which is fine. Then the assessment goes on: “While the recovery started in the external sector, domestic demand is now driving GDP growth. It expanded by more than 8% (y-o-y) in the first nine months of 2015, with household consumption growing by 3.5% and investment by over 25%.” I covered the latest figures for Irish national accounts in a series of posts here: http://trueeconomics.blogspot.com/2015/12/131215-irish-national-accounts-3q-post.html, and in particular, domestic demand growth drivers here: http://trueeconomics.blogspot.ie/2015/12/111215-irish-national-accounts-3q-post.html. And as I noted in my analysis, the problem is that Domestic Demand printed by CSO no longer actually reflects purely indigenous economy activity. All of which goes to heart of the argument that so-called domestic demand-reported ‘investment’ is heavily polluted by MNCs and aircraft purchases. In other words, stripping out effects of MNCs on domestic demand, actual growth has once again been heavily (around 1/2) concentrated in the external (MNCs-led) sectors. And worse, going forward, transfers of patents signal that Irish economy is likely to become even more unbalanced in the future, with tax arbitrage inflows from the rest of the world to Ireland making us ever more dependent on remaining a corporate tax haven in the face of globally changing taxation environment. Politically correct public communications from the EU Commission won’t put it this way, but we know that behind the scenes, our shenanigans, like the introduction of the ‘Knowledge Development Box’ tax loophole are unlikely to go unnoticed… especially when it leads to a 100% growth in patents offshoring. 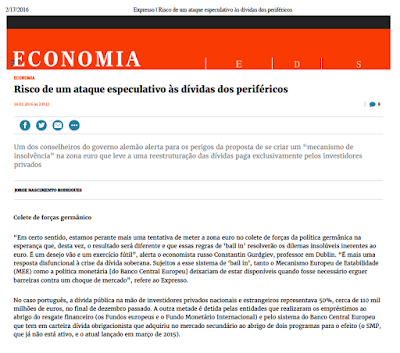 My comment on the Germany's "Sages" proposal for sovereign bonds bail-ins rule for Portugal's Expresso: http://expresso.sapo.pt/economia/2016-02-16-Risco-de-um-ataque-especulativo-as-dividas-dos-perifericos. The proposed 'sovereign bail-in' mechanism represents another dysfunctional response to the sovereign debt crisis in the Euro area. The mechanism de facto exposes sovereigns locked in a currency union to the full extent of monetary and fiscal risks that reside outside their control, while reinforcing the risks arising from their inability to control their own monetary policies. Under the current system, a run on the sovereign debt in the markets for any individual state can be backstopped via ESM as a lender of last resort. In a normally functioning currency union, such a run can be backstopped also via monetary policy and fiscal mechanisms. In contrast, within the proposed bail-in system, both the ESM and the monetary policy become unavailable when it comes to securing a backstop against a market shock. The full extent of a run on Government bond for a member state will befall the fiscal authorities of the member state - aka the taxpayers who will end up paying for bonds bail-ins through higher yields of Government debt and fiscal squeeze on expenditure and taxation. thirdly, the implementing country must have strong fiscal balancesheet to absorb shocks of risk-repricing during the period of bail-in rule introduction. None of these conditions are satisfied by the Euro 'periphery' states today, nor are likely to be satisfied by them in the foreseeable future. At least two of the three necessary conditions are not satisfied by the vast majority of the Euro area states at the moment and are also unlikely to be satisfied by them in the foreseeable future. In a sense, we are witnessing another attempt to put Euro area into a Germanic policy straightjacket in a hope that this time around, the outcome will be different and that bail-ins rules will fix the unresolvable dilemmas inherent in the Euro design. It is a vain hope and a futile exercise that is creating more risks in exchange for no tangible gain. 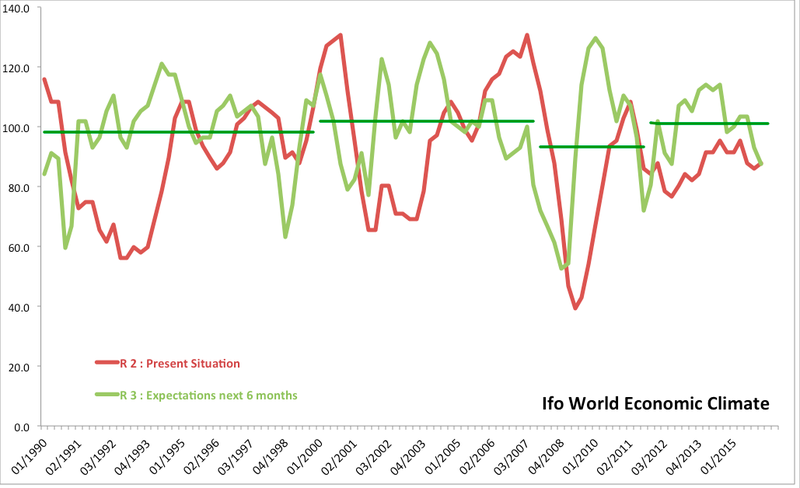 Global growth leading indicators are screaming it, Baltic Dry Index is screaming it, PMIs are screaming it, BRICS are living it, and now Ifo surveys are showing it: global economy is heading into a storm. The latest warning is from the Ifo World Economic Climate Index. 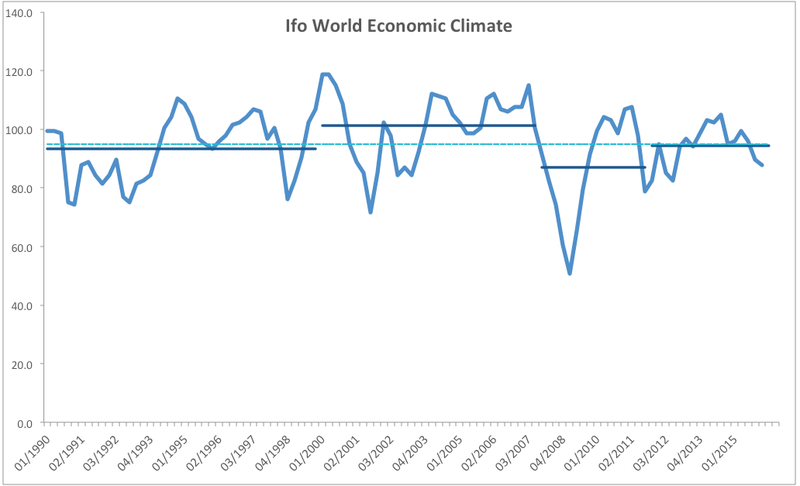 Headline World Economic Climate Index is now averaging 88.7 over the two quarters through 1Q 2016, which is statistically below 97.7 average for the 2 quarters through 3Q 2015 and 93.2 average for 4 quarters through 1Q 2016. Current 2 quarters average is way lower than 8 quarters average of 98.4. Historical average is 94.9, but when one considers only periods of robust economic growth, the index average is 98.9. Again, current 2 quarters average is significantly below that. Present Situation sub-index 2 quarters average is at 87.0, which is woefully lower than 2 quarters average through 3Q 2015 at 91.6 and is well below 96.0 average for the historical series covering periods of robust economic expansions. Expectations for the next 6 months sub-index is at 90.4 on the 2 quarters average basis, down from 103.5 2 quarters average through 3Q 2015 and below historical (expansion periods only) average of 101.5. 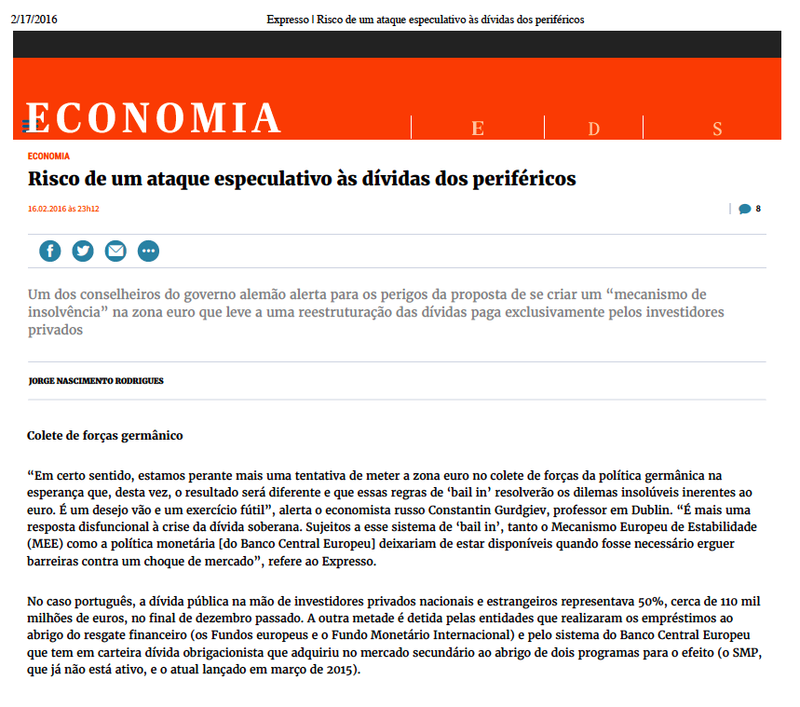 You can see my analysis of the European index data here: http://trueeconomics.blogspot.com/2016/02/5216-ifo-economic-climate-index-for.html. This week was quite a tumultuous one for banks, and especially Europe’s champion of the ‘best in class’ TBTF institutions, Deutsche Bank. Here’s what happened in a nutshell. Deutsche’s 6 percent perpetual bonds, CoCos (more on this below), with expected maturity in 2022, used to yield around 7 percent back in January. Having announced massive losses for fiscal year 2015 (first time full year losses were posted by the DB since 2008), Deutsche was under pressure in the equity markets. Rather gradual sell-off of shares in the bank from the start of 2015 was slowly, but noticeably eroding bank’s equity risk cushion. So markets started to get nervous of the second tier of ‘capital’ held by the bank - second in terms of priority of it being bailed in in the case of an adverse shock. This second tier is known as AT1 and it includes those CoCos. Yields on CoCos rose and their value (price) fell. This further reduced Deutsche’s capital cushion and, more materially, triggered concerns that Deutsche will not be calling in 2022 bonds on time, thus rolling them over into longer maturity. Again, this increased losses on the bonds. 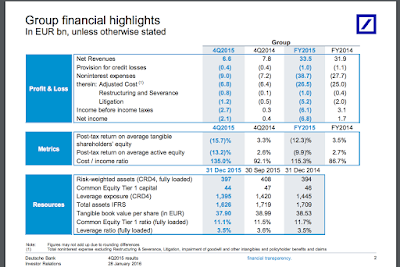 These losses were further compounded by the market concerns that due to a host of legal and profit margins problems, Deutsche can suspend payments on CoCos coupons, if not in 2016, then in 2017 (again, more details on this below). Which meant that in markets view, shorter-term 2022 CoCos were at a risk of being converted into a longer-dated and zero coupon instrument. End of the game was: Coco’s prices fell from 93 cents to the Euro at the beginning of January, to 71-72 cents on the Euro on Monday this week. When prices fall as much as Deutsche’s CoCos, investors panic and run for exit. Alas, dumping CoCos into the markets became a problem, exposing liquidity risks imbedded into CoCos structure. There are two reasons for the liquidity risk here: one is general market aversion to these instruments (a reversal of preferences yield-chasing strategies had for them before); and lack of market makers in CoCos (thin markets) because banks don’t like dealing in distressed assets of other banks. Worse, Asian markets were largely shut this week, limiting potential pool of buyers. Spooked by shrinking valuations and falling liquidity of the Deutsche’s AT1 instruments, investors rushed into buying insurance against Deutsche’s default on senior bonds - the Credit Default Swaps or CDS. 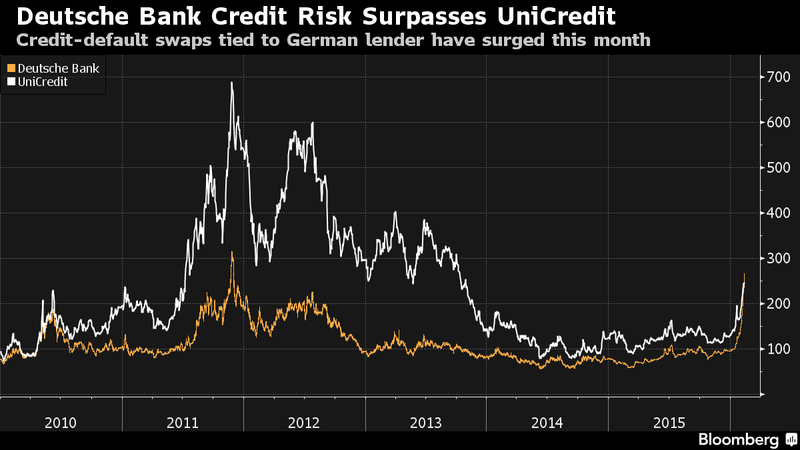 This propelled Deutsche’s CDS to their highest levels since the Global Financial Crisis. Deutsche’s CDS shot straight up and with their prices rising, implied probability of Deutsche’s default went through the roof, compounding markets panic. Deutsche Bank AG is a massive, repeat - massive - banking behemoth. And the beast is in trouble. Let’s do some numbers first. 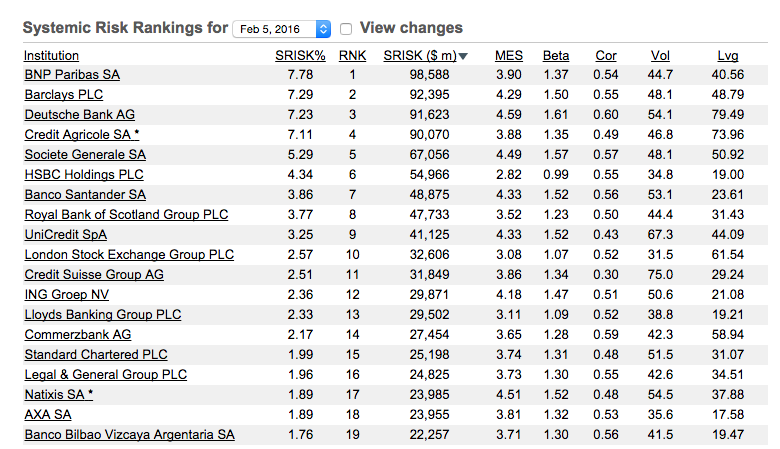 Take a rather technical test of systemic risk exposures by the banks, run by NYU Stern VLab. First number of interest: Systemic Risk calculation - the value of bank equity at risk in a case of systemic crisis (basically - a metric of how much losses a bank can generate to its equity holders under a systemic risk scenario). Deutsche clocks USD91.623 billion hole relating to estimated capital shortfall after the existent capital cushion is exhausted. A wallop that is the third largest in the world and accounts for 7.23% of the entire global banking system losses in a systemic crisis. Now, for volatility that Deutsche can transmit to the markets were things to go pear shaped. How much of a daily drop in equity value of the Deutsche will occur if the aggregate market falls more than 2%. The metric for this is called Marginal Expected Shortfall or MES and Deutsche clocks in respectable 4.59, ranking it 8th in the world by impact. In a sense, MSE is a ‘tail event’ beta - stock beta for times of significant markets distress. How closely does Deutsche move with the market over time, without focusing just on periods of significant markets turmoil? That would be bank’s beta, which is the covariance of its stock returns with the market return divided by variance of the market return. 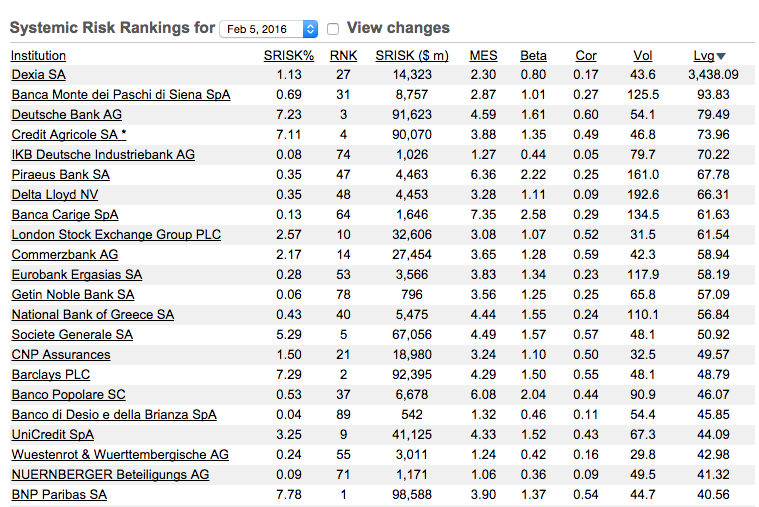 Deutsche’s beta is 1.61, which is high - it is 7th highest in the world and fourth highest amongst larger banks and financial institutions, and it basically means that for 1% move in the market, on average, Deutsche moves 1.6%. 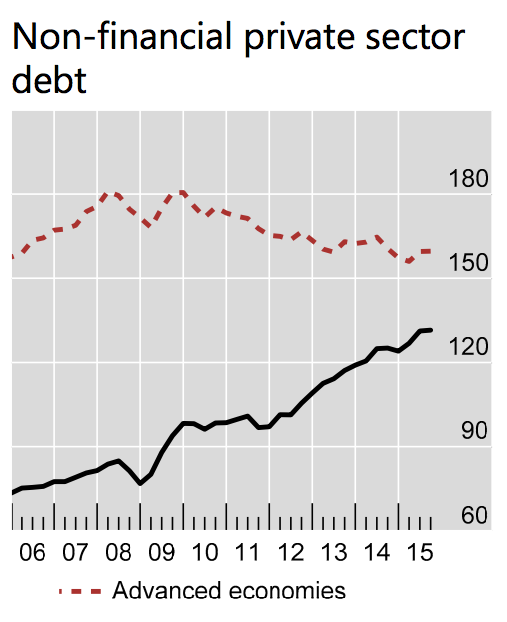 But worse: Deutsche leverage is extreme. 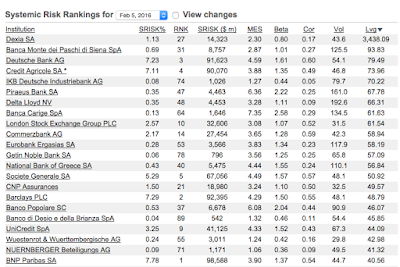 Save for Dexia and Banca Monte dei Paschi di Siena SpA, the two patently sick entities (one in a shutdown mode another hooked to a respirator), Deutsche is top of charts with leverage of 79.5:1. So Deutsche is loaded with the worst form of disease - leverage and it is caused by the worst sort of underlying assets: the impenetrable derivatives (see below on that). Leverage and quality of assets. These problems plague all European TBTF banks ever since the onset of the Global Financial Crisis. The legacy of horrific misspelling of products, mis-pricing of risks and markets distortions by which European banks stand is contrasted by the rhetoric emanating from European regulators about ‘reforms’, ‘repairs’ and ‘renewed regulatory vigilance’ in the sector. In truth, as Deutsche’s saga shows, capital buffers fixes, applied by European regulators, have yielded nothing more than an attempt to powder over the miasma of complex, derivatives-laden asset books and equally complex, risk-obscuring structure of new capital buffers. It also highlights just how big of a legal mess European banks are, courtesy of decades of their maltreatment of their clients and markets participants. So let’s start churning through them one-by-one. Mortgages-Backed Securities (alleged) fraud with respect to the U.S. state-sponsored lenders: Fannie Mae and Freddie Mac. U.S. probe into Mortgages-Backed Securities it wrote and sold pre-crisis. 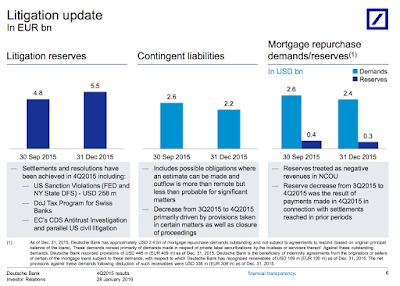 If one goes by the Deutsche peers, the USD15.3 billion paid and set aside to-date is not going to be enough. For example, JP Morgan total cost of all settlements in the U.S. alone is in excess of USD23 billion. 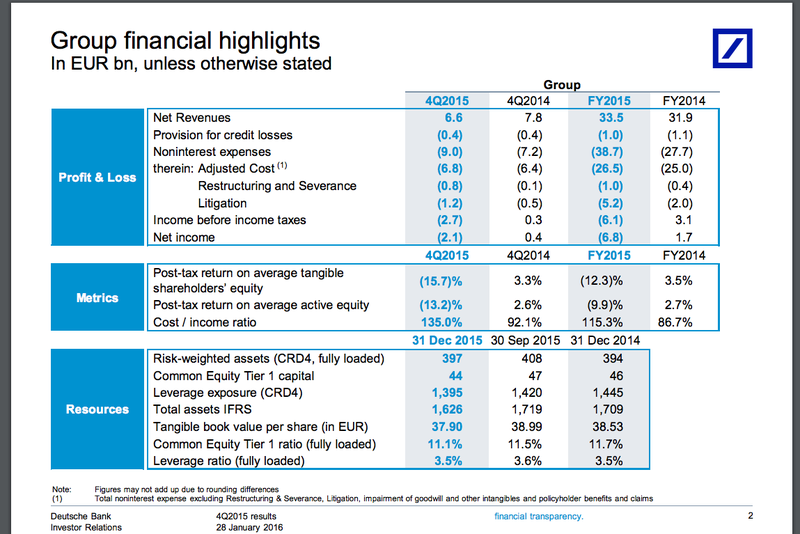 But Deutsche is a legal basket case compared to JPM-Chase. JPM, Bank of America and Citigroup paid around USD36 billion on their joint end. 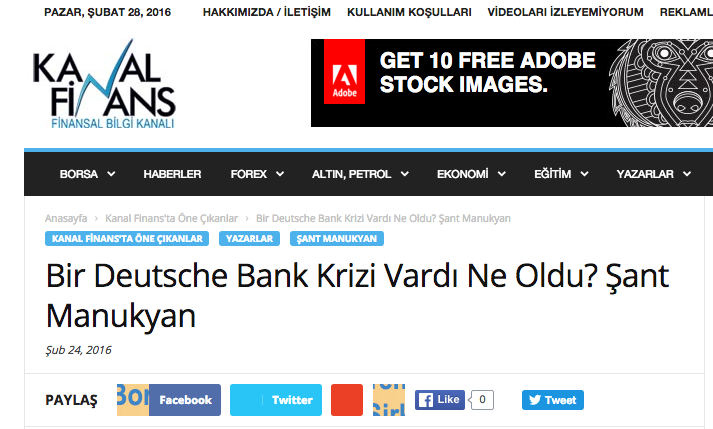 In January 2016, Goldman Sachs reached an agreement (in principle) with DofJustice to pay USD5.1 billion for same. Just this week (http://www.businessinsider.com/morgan-stanley-mortgage-backed-securities-settlement-2016-2) Morgan Stanley agreed to pay USD3.2 billion on the RMBS case. Some more details on this here: http://www.reuters.com/article/us-deutsche-bank-lawsuit-idUSKCN0VC2NY. Probes into currency manipulations and collusion on its trading desk (DB is the biggest global currency trader that is yet to settle with the U.S. DoJustice. In currency markets rigging settlement earlier, JPMorgan, Citicorp and four other financial institutions paid USD5.8 billion and entered guilty pleas already. Related to currency manipulations probe, DB is defending itself (along with 16 other financial institutions) in a massive law suit by pension funds and other investors. 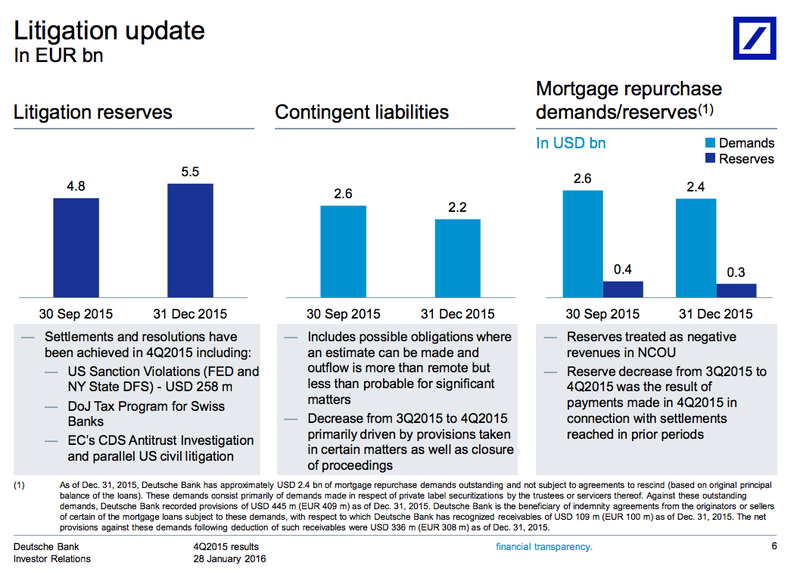 Deutsche says ‘nothing happened’. Nine out of the remaining 15 institutions are pushing to settle the civil suit for (at their end of things) USD2 billion. Keep in mind of all civil suit defendants - Deutsche is by far the largest dealer in currency markets. Worse, UK regulators are having a close watch on Deutsche Bank - in 2014, they placed it on the their "enhanced supervision" list, reserved for banks that have either gone through a systemic failure or are at a risk of such; a list that includes no other large banking institution on it, save for Deutsche. This is hardly an end to the Deutsche woes. Currently, it is among a group of financial institutions under the U.S. investigation into trading in the U.S. Treasury market, carried out by the Justice Department. The bank is also under inquiries covering alleged fixings of precious metals benchmarks. The bank is even facing some legal problems relating to its operations (in particular hiring practices) in Asia. And it is facing some trading-related legal challenges across a number of smaller markets, as exemplified by a recent case in Korea (http://business.asiaone.com/news/deutsche-bank-trader-sentenced-jail). You really can’t make a case any stronger: Deutsche is a walking legal nightmare with unknown potential downside when it comes to legal charges, costs and settlements. More importantly, however, it is a legal nightmare not because regulators are becoming too zealous, but because, like other European banks, adjusting for its size, it has its paws in virtually every market-fixing scandal. The history of European banking to-date should teach us one lesson and one lesson only: in Europe, honest, functioning and efficient markets have been seconded to manipulated, dominated by TBTF institutions and outright rigged structures more reminiscent of business environment of the Italian South, than of Nordic ‘regulatory havens’. CoCos, Contingent Convertible Capital Instruments, are a hybrid form of capital instruments that are designed and structured to absorb losses in times of stress by automatically converting into equity should a bank experience a decline in its capital ratios below a certain threshold. Because they are a form of convertible debt, they are counted as Tier 1 capital instrument ‘additional’ Tier 1 instruments or AT1. CoCos are also perpetual bonds with no set maturity date. Banks can be redeemed them on option, usually after 5 years, but banks can also be prevented by the regulators from doing so. The expectation that banks will redeem these bonds creates expectation of their maturity for investors and this expectation is driven by the fact that CoCos are more expensive to issue for the banks, creating an incentive for them to redeem these instruments. European banks love CoCos, in contrast to the U.S. banks that issue preferred shares as their Tier 1 capital boosters, because Europeans simply love debt. Debt in any form. It gives banks funding without giving it a headache of accounting to larger pools of equity holders, and it gives them priority over other liabilities. 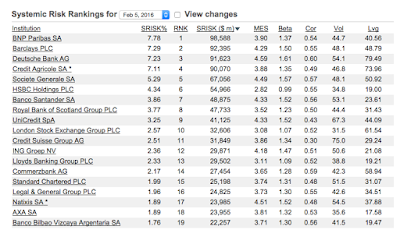 AT1 is loved by European regulators, because it sits right below T1 (Tier 1) and provides more safety to senior bondholders on whose shoulders the entire scheme of European Ponzi finance (using Minsky’s terminology) rests. In recent years, Deutsche, alongside other banks was raising capital. Last year, Credit Suisse, went to the markets to raise some CHF6 billion (USD6.1 billion), Standard Chartered Plc raised about $5.1 billion. Bank of America got USD5 billion from Warren Buffett in August 2014. So in May 2014, Deutsche was raising money, USD 1.5 billion worth, for the second time (it tapped markets in 2013 too). The fad of the day was to issue CoCos - Tier 1 securities, known as Contingent Convertible Bonds. All in, European banks have issued some EUR91 billion worth of this AT1 capital starting from 2013 on. Things were hot in the markets then. Enticed by a 6% original coupon, investors gobbled up these CoCos to the tune of EUR3.5 billion (the issue cover was actually EUR25 billion, so the CoCos were in a roaring demand). Not surprising: in the world of low interest rates, say thanks to the Central Banks, banks were driving investors to take more and more risk in order to get paid. That is Prospectus-Speak for saying that CoCos can suspend interest payments per clauses, before the capital adequacy problems arise. The risks of such an event are not covered by Credit Default Swaps (CDS) which cover default risk for senior bonds. The reason for this clause is that European regulators impose on the banks what is known as CRD (Combined Buffer Requirement and Maximum Distributable Amount) limits: If the bank total buffers fall below the Combined Buffer Requirement, then CoCos and other similar instruments do not pay in full. That is normal and the risk of this should be fully priced in all banks’ CoCos. But for Deutsche, there is also a German legal requirement to impose an additional break on bank’s capital buffers depletion: a link between specified account (Available Distributable Items) balance and CoCos pay-out suspension. This ADI account condition is even more restrictive than what is allowed under CRD. This week, DB said they have some EUR1 billion available in 2016 to pay on EUR350 million interest coupon due per CoCos (due date in April). 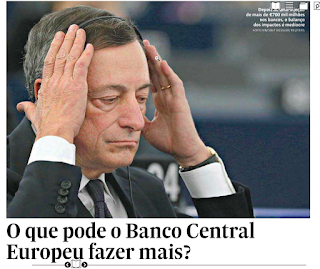 But few are listening to DB’s pleas - CoCos were trading at around 75 cents in the euro mark this week. The problem is that the markets are panicked not just by the prospect of the accounting-linked suspension of coupon payments, but also by the rising probability of non-redemption of CoCos in the near future - a problem plaguing all financials. DB is at the forefront of these latter concerns, because of its legal problems and also because the bank is attempting to reshape its own business (the former problem covered above, the latter relates to the discussion below). DB just announced a massive EUR6.8 billion net loss for 2015 which is not doing any good to alleviate concerns about it’s ability to continue funding coupon payments into 2017. Unknown legal costs exposure of DB mean that DB-estimated expected funding capacity of some EUR4.3 billion in 2017 available to cover AT1 payments is based on its rather conservative expectation for 2016 legal costs and rather rosy expectations for 2016 income, including the one-off income from the 2015-agreed sale of its Chinese bank holdings. Earlier this week, Standard & Poor’s, cut DB’s capital ratings on “concerns that Germany’s biggest lender could report a loss that would restrict its ability to pay on the obligations”. S&P cut DB’s Tier 1 securities from BB- to B+ from BB- and slashed perpetual Tier 2 instruments from BB to BB-. DB is also suffering the knock-on effect of the general gloom in the European debt markets. Based on Bloomberg data, high yield corporate bonds issuance in Europe is down some 78 percent in recent months, judging by underwriters fees. These woes relate to European banks outlook for 2016, which links to growth concerns, net interest margin concerns and quality of assets concerns. Badsky Loansky: A Eurotown’s Bad Bear? Equity and debt markets repricing of Deutsche paper is in line with a generally gloomy sentiment when it comes to European banks. The core reason is that aided by the ECB’s QE, the banks have been slow cleaning their acts when it comes to bad loans and poor quality assets. European Banking Authority estimates that European banks hold some USD 1.12 trillion worth of bad loans on their books. 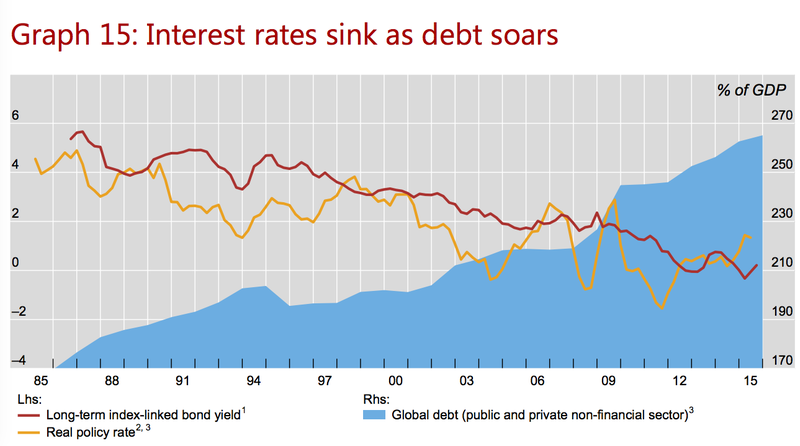 These primarily relate to the pre-crisis lending. 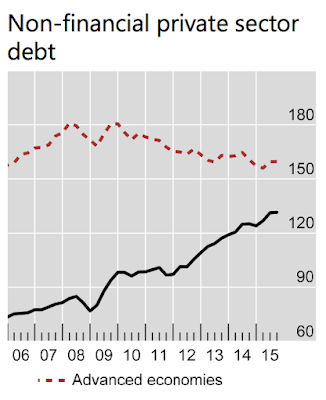 But, beyond this mountain of bad debt, we have no idea how many loans are marginal, including newly issued loans and rolled over credit. 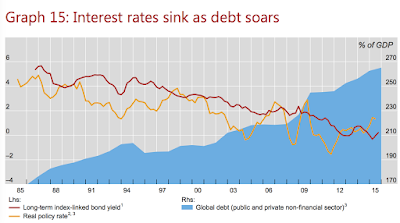 How much of the current credit pool is sustained by low interest rates and is only awaiting some adverse shock to send the whole system into a tailspin? Such a shock might be borrowers’ exposures to the US dollar credit, or it might be companies exposure to global growth environment, or it might be China unwinding, or all three. Not knowing is not helpful. Oil price collapse, for example, is hitting hard crude producers. Guess who were the banks’ favourite customers for jumbo-sized corporate loans in recent years (when oil was above USD50pb)? And guess why would any one be surprised that with global credit markets being in a turmoil, Deutsche’s fixed income (debt) business would be performing badly? 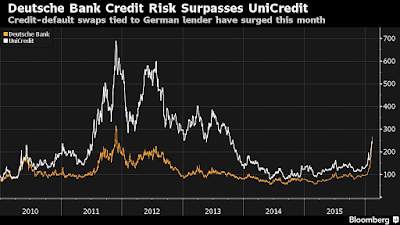 Deutsche and other european banks are caught in a dilemma. Low rates on loans and negative yields on Government bonds are hammering their profit margins (based on net interest margin - the difference between their lending rate and their cost of raising funds). Solution would be to raise rates on loans. But doing so risks sending into insolvency and default their marginal borrowers. Meanwhile, the pool of such marginal borrowers is expanding with every drop in oil prices and every adverse news from economic growth front. So the magic potion of QE is now delivering more toxicity to the system than good, and yet, the system requires the potion to flow on to sustain itself. 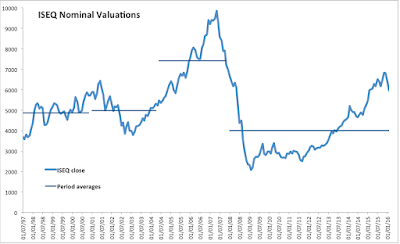 Again, this calls in Minsky: his Ponzi finance thesis that postulates that viability of leveraged financial system can only be sustained by rising capital valuations. 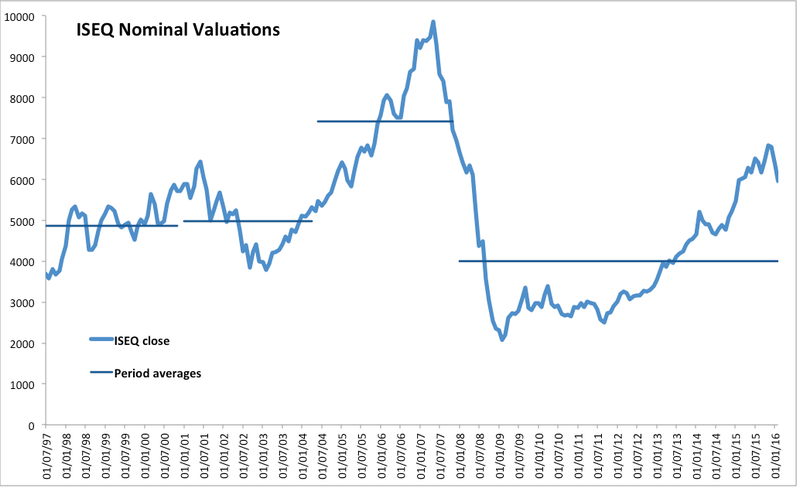 When capital valuations stop growing faster than the cost of funding, the system collapses. Back to the performance to-date, however. Deutsche Bank's share price literally fell off the cliff at the start of this week, falling 10 percent on Monday and hitting its lowest level since 1984. On bank’s performance side, concerns are justified. As I noted earlier, Deutsche posted a massive EUR6.89 billion loss for the year, with EUR2 billion of this booked in 4Q alone. Compared to 2014, Deutsche ended 2015 with its core equity Tier 1 capital (the main buffer against shocks) down from EUR60 billion to EUR52 billion. Still, panic selling pushed DB equity valuation to EUR19 billion, in effect implying that some 2/3rds of the book of its assets are impaired. Which is nonsense. Things might be not too good, but they aren’t that bad today. 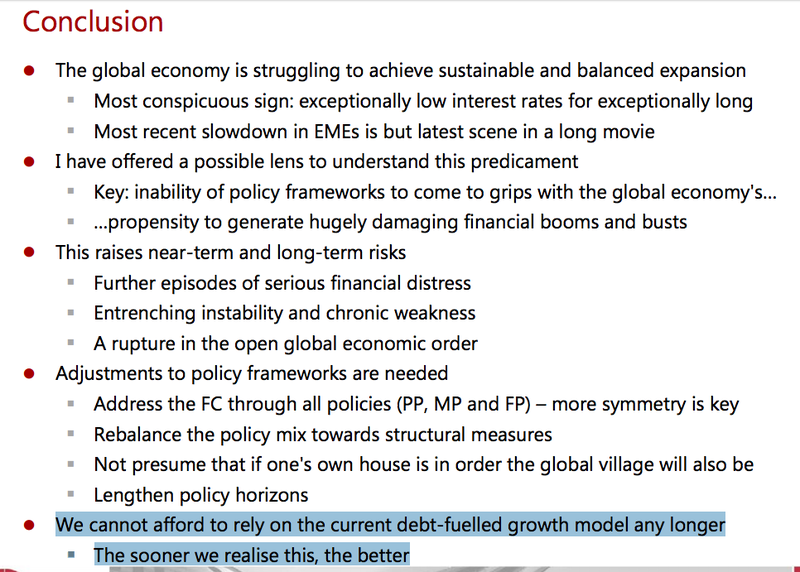 The real worry with assets side of the DB is not so much current performance, but forward outlook. And here we have little visibility, precisely because of the utterly abnormal conditions the banks are operating in, courtesy of the global economy and central banks. So markets are exaggerating the risks, for now. Psychologically, this is just a case of panic. But panic today might be a precursor to the future. More of a longer term concern is DB’s exposure to the opaque world of derivatives that left markets analysts a bit worried (to put things mildly). Deutsche has taken on some pretty complex derivative plays in recent years in order to offset some of its losses relating to legal troubles. These instruments can be quite sensitive to falling interest rates. Smelling the rat, current leadership attempted to reduce bank’s risk loads from derivatives trade, but at of the end of 2015, the bank still has an estimated EUR1.4 trillion exposure to these instruments. Only about a third of the DB’s balance sheet is held in German mortgages and corporate loans (relatively safer assets), with another third composed of derivatives and ‘other’ exposures (where ‘other’ really signals ‘we don’t quite feel like telling you’ rather than ‘alternative assets classes’). For these, the bank has some EUR215 billion worth of ‘officially’ liquid assets - a cushion that might look solid, but has not been tested in a sell-off. 2) We have a massive problem of residual, unresolved issues arising from incomplete response to markets abuses that took place before, during and after the crisis. 10/2/16: Slon.ru: "Чем хуже, тем лучше"
10/2/16: IMF to Ukraine: Sort Thyselves! 9/2/16: Echoes of 2011 at Deutsche?